Floyd Town Hall is located at 138 Wilson Street, Floyd, VA 24091; phone: 540-745-2565. Photo: Glenanna, ca. 1849, 204 West Main Street, Floyd, VA. Listed on the National Register of Historic Places in 2002. Photographed by User:Skye Marthaler (own work), 2013, [cc-by-3.0 (creativecommons.org/licenses/by/3.0)], via Wikimedia Commons, accessed February, 2014. 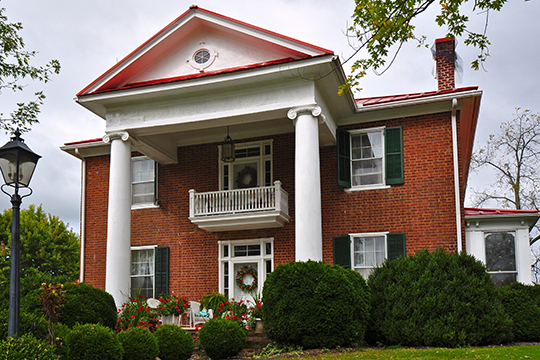 The Town of Floyd, in southwestern Virginia, was laid out in the early 1830s as the county seat of Floyd County, which was formed in 1831 from Montgomery County. Originally known as Jacksonville, Floyd was just being laid out in 1831. Since its establishment, Floyd has served as the political, social, and economic hub of Floyd County. It was established as the support community for the Floyd County court, which occupied buildings in the public square at the center of town. By 1835 a small commercial and industrial center had developed in the town that included two general stores, a tavern, a blacksmith shop, a tanyard, and a saddle making facility. The earliest buildings were small in scale and of frame or log construction. By deed dated July 16, 1832, Abraham Phlegar and his wife conveyed to the Justices of the Peace of Floyd County one acre of land "for and in consideration of the location of the county seat of said county being located on and adjoining the lands of said Phlegar." The deed stipulated that "Public Buildings" for the county would be erected on the property. Construction of the county courthouse and jail on the property donated by the Phlegars was begun in 1832. In addition, Manasseh Tice and his wife conveyed five acres of land to the Justices by deed dated July 16, 1832, "for and in consideration of the county seat for said county being located on and adjoining their land." The Tice land was described as "... being a part of and adjoining the public square ... and included within the boundaries of ten acres with the reservation of every other lott for the benefit of said Tice ... Reserving as aforesaid every other half acre lott to the said Manasseh Tice for his own benefit." Marguerite Tise, who collected information about Floyd County and whose papers were donated to the Virginia Room at the City of Roanoke Public Library, explains this arrangement as a benefit for both sides. She states, further, that the construction of the courthouse "on the public square" was begun in 1832 and "lots were made available for sale." The names of the two streets were Main Street, going east and west, and Cross Street (now called Locust Street), going north and south. Michael J. Pulice, Patricia Dillon (intern under supervision of Dr. John Kern),Virginia Department of Historic Resources; Kathleen Ingoldsby, Floyd Historical Society; Belinda C. Reeder, Architect, Floyd Historic District, Floyd County, VA, nomination document, 2005, National Park Service, National Register of Historic Places, Washington, D.C.